← What happened in Sociamind in 2015? Welcome to the first Sociamind post of 2016. 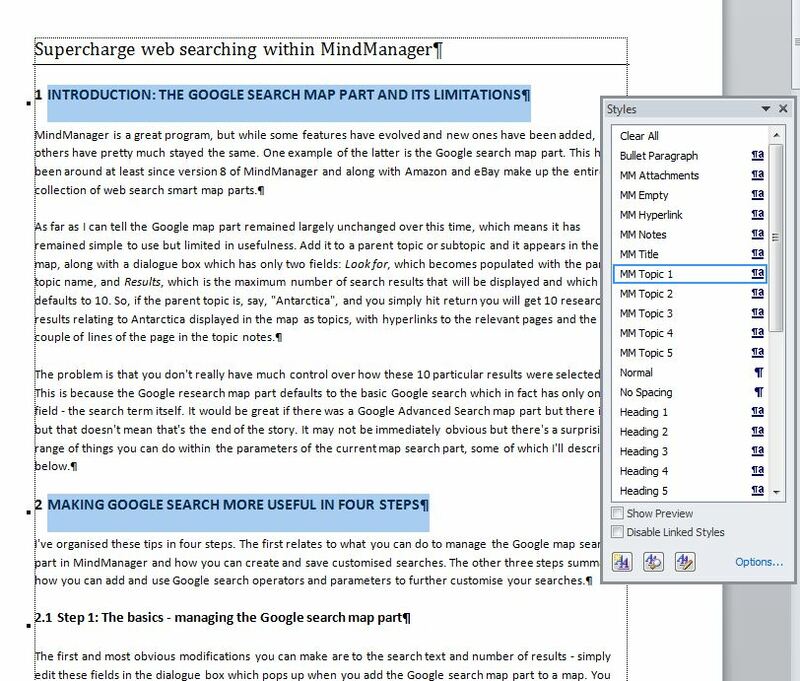 Recently I described my technique for using MindManager (MM) to write blog posts which involved exporting a map to Word and then importing from there to WordPress. I extolled the virtues of using WordX, the Word export add-in from Olympic Limited, to complete the MM to Word export process rather than MM’s built-in export facility, mainly because of the former’s much greater flexibility in selecting what to export and at what heading level, and the fact that it retains the Word template styles and style names. In the article I commented that as I mainly use WordX I had not tried the standard MM Word export for this purpose though I believed that it should work, with the caveat that the process could be complicated by MindManager adding its own version of the Word heading styles. Subsequently in responding to a query on the Mindjet forum I’ve checked out whether a document created in Word using the standard MM export can be imported successfully into WordPress, only to discover that while it is imported it loses its Word heading structure. This is because WordPress doesn’t recognise the Word heading styles which MM introduces. I suspect that WordPress isn’t the only program where this occurs when interacting with Word. It is also an issue if you want to do further editing of an exported document in Word and/or if you are exporting material from MM into an existing Word document, as the document will contain two sets of Word styles. While these are obviously strong arguments for using WordX which is an excellent add-in, not everyone wants (or can afford to buy) an add-in just for Word export, especially if they do this only occasionally. There is another group of affected users who have no choice in the matter – those with the Mac version of MM, as there is no corresponding Mac version of WordX. This was the situation of the person who raised the issue on the MM forum. The following is an edited version of the response I provided which described a work-around if you are using the conventional MM-to-Word export facility. As I note above, the main problem with the inbuilt Word export in the Windows version of MM and I suspect the Mac version as well is the way in which the program replaces the standard heading styles in the Word template being used for the export with styles which look the same but are given completely different names. For example, the “Heading 1” style in the Word template will be renamed “MM Topic 1”, and so on. This means that documents exported from the Windows version of MM using the MM export facility will look identical to those exported using WordX, but the names of the underlying styles in the former will have all been changed. Open the document after it has been exported from MM to Word and select a heading at the highest level of headings. Go to Styles tab on the ribbon and click the button to show the Styles Window. The MM Topic 1 style should be selected. Click on the drop-down arrow next to the style and click on Select All. All the top level headings in the document should be selected. Scroll up or down the styles window until you find the Heading 1 style. Click on this to apply this style to all the headings with the MM Topic 1 style (when you do this you may find the cursor is moved abruptly to the last heading in the document). Repeat this for all the other headings and specially formatted styles, so for example replace the MM Topic 2 style with Heading 2, etc. Save the document then copy and paste it to WordPress. The heading structure should be reproduced (depending on the WP theme you are using). These instructions assume you want to want the document to end up in WordPress with the WordPress Heading 1 style corresponding to the Word Heading 1 style, and so on. If like me you find the top level headings in the particular WordPress theme you are using to be a bit “loud” you can always replace the MM topic 1 style with the Word Heading 2 style and cascade this through the other headings. This entry was posted in Export, Mind Mapping, Research and Writing and tagged Mind Mapping, MindManager. Bookmark the permalink.